Global Solace Inc (GSI) is a Maryland USA based 501(c)(3) non-profit organization with the mission to bring reliable and renewable sources of energy to some of the 1.2 billion people living in energy poverty in the developing world. GSI aims to improve the lives of individuals and communities through the implementation of sustainable, renewable solar energy PV electric systems and computer networks with internet access, therefore increasing access to education, health, and social services. To achieve this vision, GSI works closely with identified communities through partner organizations to install renewable energy systems in schools, medical buildings, community centers, and more. Additionally, GSI educates and trains local populations on renewable energy technology, design, installation, and repair in order to build local capacity, create jobs, and stimulate the local economy. GSI’s expertise is the engineering, procurement, and construction of solar photovoltaic (PV) electricity generating systems, and the installation and maintenance of computer application software. GSI partners with other NGOs to provide complementary services to our electric power installations in schools and health clinics such as Teachers Without Borders and Doctors Without Borders. We welcome inquiries from NGOs seeking assistance in our areas of expertise. Consulting: GSI has a commercial group which responds to RFPs and provides solar PV site visit, design, and installation services for clients worldwide. If your organization has a potential site that needs our services, please contact us by phoning (301) 972-8672 or filling out the “Suggest a Project or Partner” form. 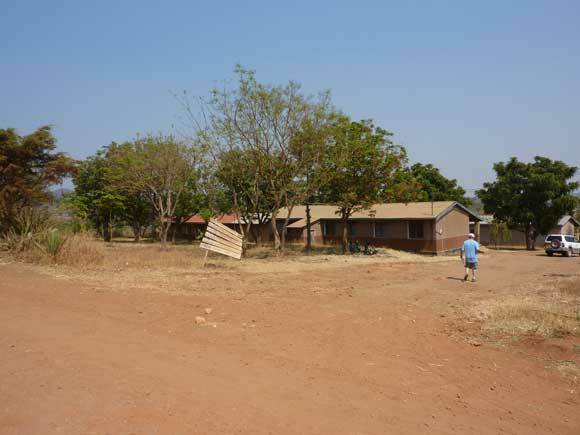 Tanzania: the Health Clinic at Mbuyuni in the far west of the country. 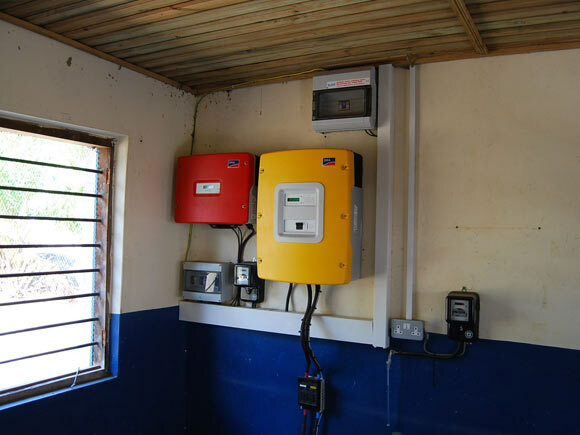 Kenya: example of the Sunny Boy inverters for a mini-grid. 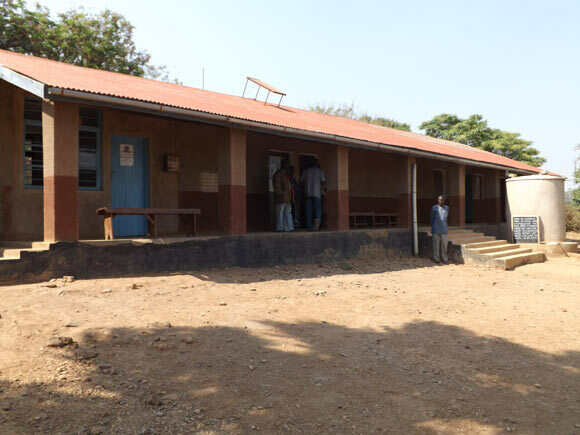 Tanzania: a typical health clinic building with one solar panel to power several lights. 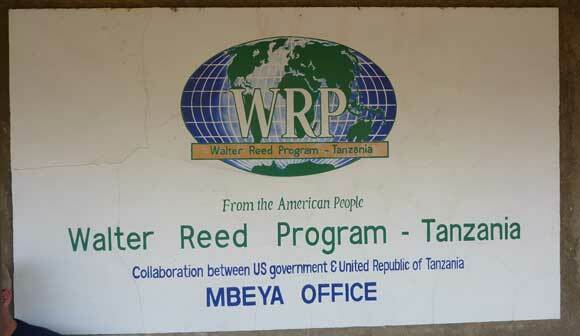 Tanzania: consulting with our partner the Walter Reed Program. 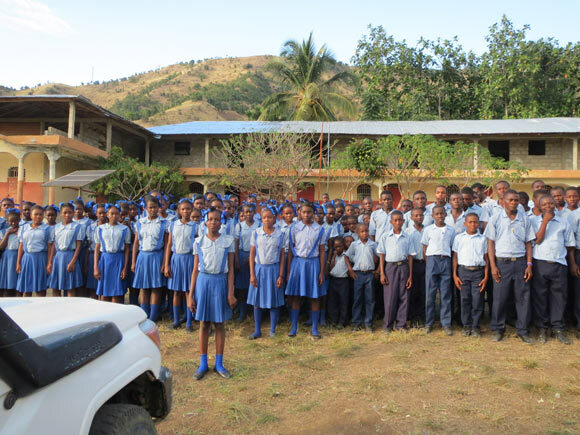 Haiti: The school body at Carcasse. 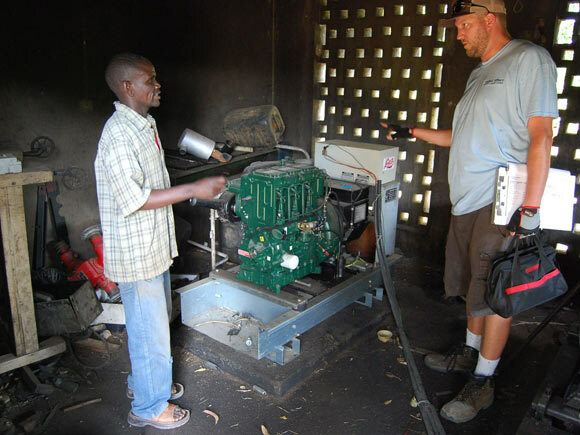 Tanzania: discussing how to integrate the existing diesel generator. 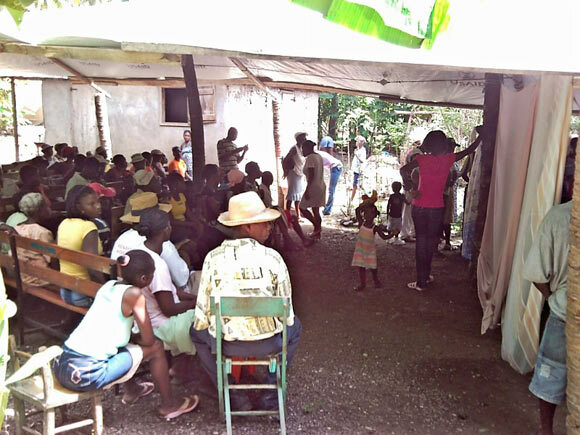 Haiti: Patients waiting for service at the health clinic. Our computers will be doing patient intake here. 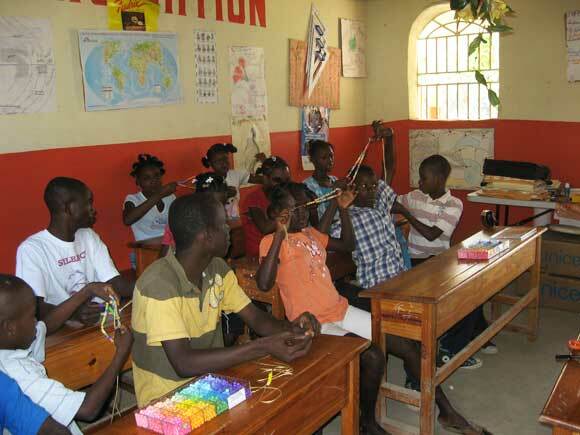 Haiti: Students working on crafts provided by local Catholic parish. The typical solar PV installation consists of an array of at least four solar modules mounted on a ground, top of pole, or roof racking system. The modules provide direct current (DC) to a charge controller which connects to a group of batteries which store daytime power for night time usage. The charge controller maintains the charge in the batteries appropriately to maximize the life of the batteries. An electrical device called an inverter is connected to the batteries to convert the DC power to standard alternating current (AC) which is distributed through the buildings. The systems are matched with the standard power available in the country which is typically 230 volts, and 50 HZ. A typical GSI system has twelve (12) solar modules providing 3,000 watts or 3 kW. The system is easily expandable in units of 1 kW (four modules), ranging from a 1 kW system up to 50 or even 100 kW. A 1 kW system could provide power to a school with six or seven rooms and larger 4 kW+ systems could provide power to nine or ten separate school or health clinic buildings. GSI provides Direct Current (DC) systems for smaller installations which can take advantage of the higher efficiency of DC appliances such as LED lights, fans, refrigerators, and cell phone chargers. We are looking for volunteers with solar PV installation and electrical skills to join us in-country to build these systems. Retired electricians may find this work especially rewarding! Global Solace installs solar powered computer networks for schools. The school network consists of one to twenty four low power computer work stations connected wirelessly to a central network file server computer. The system is connected to the Internet which opens up the world with endless possibilities to students from the developing world. The central computer runs a host of open source educational software based upon the Ubuntu Linux operating system including the One Laptop Per Child (OLPC) system developed at MIT and Sugar, a compendium of educational software from around the Internet. The system includes OpenOffice which is a free suite of programs that mimics Microsoft programs Word, Excel, and PowerPoint. The hardware includes a printer and projector for displaying information on screens. The software curriculum is designed for Preschool, Primary, Secondary, and University level students and when students log in to the system they are automatically routed to a menu of software based upon their age and development level. The system is particularly beneficial to older students as the Internet now offers OpenCourseWare classes from MIT and other colleges as well as thousands of tutorials from Kahn University. Volunteers are needed to find appropriate educational software for the various age groups and to prepare all of the necessary associated materials. Retired school teachers may find this work especially rewarding! Global Solace installs solar powered computer networks for health clinics. The clinic network consists of one to twenty four low power computer work stations connected wirelessly to a central network file server computer. The central computer runs the Patient View open source software. Patient View allows health clinics to manage patient information in rural settings where there is no internet access. The PatientView modules create patient records and allow staff to view all data relevant to an individual patient, such as future appointments, past communications, and health records. Health workers can search, sort through, update, and add new records to the central computer. Additionally, when a patient is due for an appointment, clinics can now use PatientView to find the community health worker responsible for that particular patient and send them a reminder via SMS text messaging that a visit is needed. The PatientView software is designed to manage patient information at small health centers, some of which will move on to a robust medical records system in the future, others of which will be able to use communication to send data to a medical records system at the nearest large hospital. When fully implemented, the system allows medical workers to visit patients in their home and update visit information and medical records by keying information into smart phones which are connected to the system via SMS text messaging. In 2010, Medic Mobile completed an impact analysis of its pilot implementation of PatientView at St. Gabriel’s Hospital in rural Malawi. As a result of the project, the hospital now responds to requests for remote patient care, tracks distant patients, informs community health workers of proper drug dosages and uses, receives patient updates, connects HIV positive patients to support groups, and relays outreach HIV testing schedules. With the support of GSI staff and volunteers, we will be able to offer the same services at health centers that we support. Volunteers are needed to learn and prepare all of the necessary associated materials for the Patient View software. Retired health care workers of all types may find this work especially rewarding! GSI designs and installs “mini-grids” which are simply solar PV systems connected to several buildings in a relatively small area, such as a village or a school/health center complex. Our mini-grid systems typically are “AC Coupled” which means that the solar modules are connected to an inverter located at the array producing AC power. This array or multiple arrays are connected to a main AC connection panel to which diesel generators and other AC sources may be easily connected and integrated (wind or hydro-power). The electrical wires that run to the lights, appliances and other electrical loads in the remote buildings are also connected to this AC panel. There is a large set of batteries and a Sunny Island inverter connected to the bus which controls the operation of the system. If the sun is not sufficient to power all of the electrical loads at any one time then the battery-inverter is turned on, for example at night. When the batteries need charging in the morning then the Sunny Island gets the charging power from the solar arrays or an optional generator. The use of the generator is minimized by good system design. Solar powered drip irrigation for farming collectives. We are actively looking for partners who can provide these products and services and those organizations who wish to implement any of these systems.